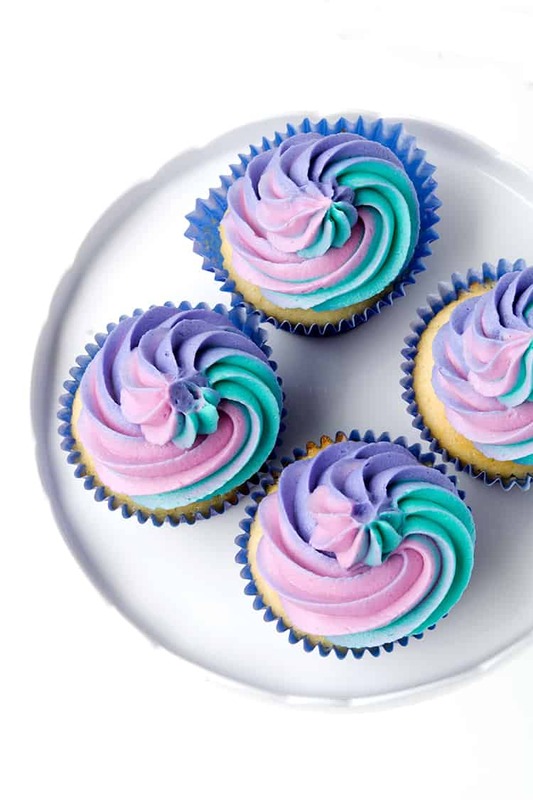 You’ll love these buttery vanilla cupcakes topped with swirls of creamy cotton candy frosting. 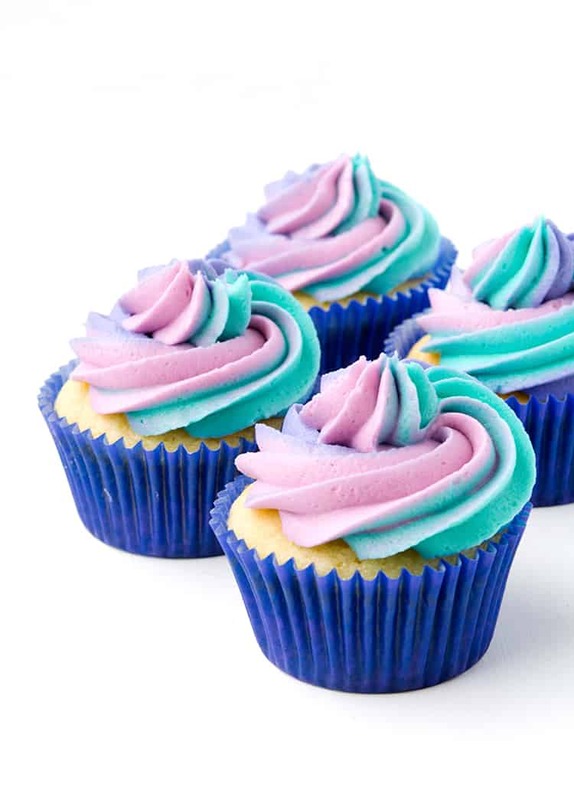 These gorgeous Cotton Candy Cupcakes will be a hit at your next party or celebration. 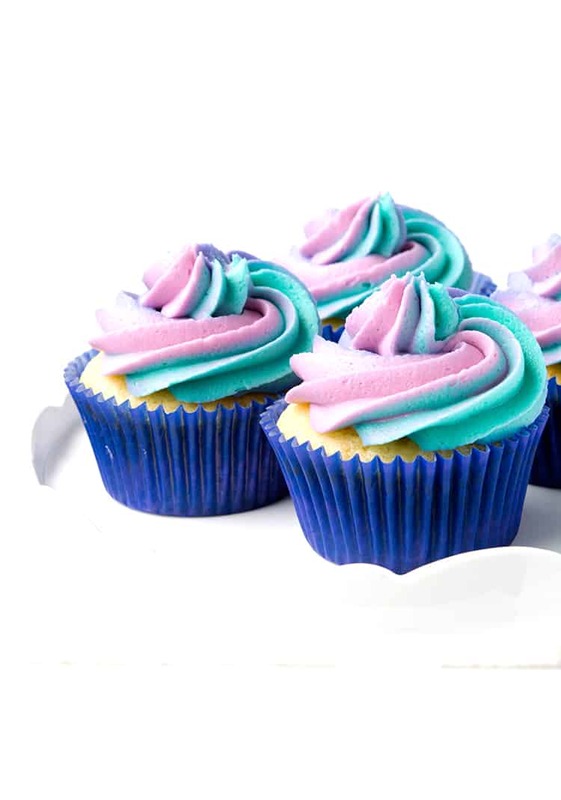 Soft and fluffy vanilla cupcakes, piled high with rainbow-coloured, cotton candy-flavoured buttercream. Can you even? They’re pretty as can be, and oh-so-tasty! These gorgeous Cotton Candy Cupcakes were actually posted on Sweetest Menu over two years ago but they were in desparate need of a reshoot. So when I made them again this weekend, I took some new photos to do them justice. When I first developed these vanilla cupcakes, I went a little crazy with the cupcake-making. I made five batches in one week, just to make sure these ones were the easiest and the best. And I love them. 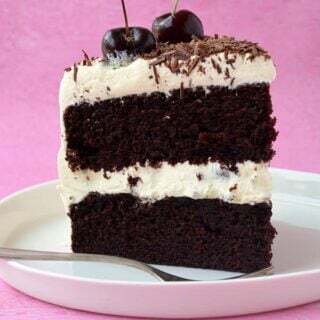 So let’s talk cake. I have a few tips to ensure your cupcakes turn out every time – most of which I have learnt the hard way. 1. When the recipe requires your butter, eggs and milk to be at room temperature, try and make sure they are actually at room temperature. I know it’s not rocket science but sometimes these little steps can make a big difference! 2. When it comes to creaming the butter and sugar, make sure your butter is soft, but not melted at all. Take time to cream the butter and sugar. Put your timer on and beat for 3 or 4 minutes and you’ll notice the difference in the texture of your cake. 3. When incorporating dry ingredients into wet ones, it’s best to add it in parts to prevent over mixing. I once read that starting with dry ingredients and ending in dry ingredients is best and I have found this to be true. Have you ever added milk or a wet ingredient at the end and found it hard to mix through? This should solve that problem. Well that’s enough serious cake talk, let’s get our carnival hats on and eat Cotton Candy Cupcakes! Buttery vanilla cupcakes topped with creamy cotton candy buttercream. Preheat the oven to 180 C(360 F). 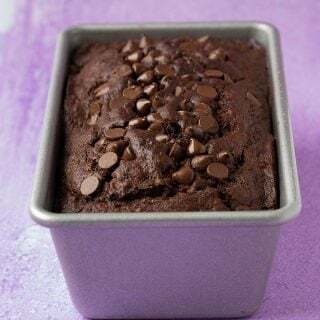 Line a 12 hole muffin tray with cupcake liners. Sift flour, baking power and salt in a bowl and whisk together. In a large mixing bowl, cream butter and sugar with an electric beater for about 3-4 minutes or until pale and creamy. Add eggs, one at a time, and beat until combined. In a separate jug, add vanilla extract to milk. Add approximately one third of your flour mixture and half of your milk mixture. Gently fold with a spatula, then add another third of flour and the rest of your milk .Finally, add final flour mixture. Your cupcake batter should be nice and creamy. Try not to over mix. Fill your prepared cupcake cases. Pop into the oven for approximately 16-18 minutes or until cakes are golden on top and spring back when lightly touched. Transfer cupcakes to a wire rack to cool completely. To make the icing, cream the butter with an electric mixer until creamy and pale. Sift in half the icing sugar and one tablespoon of milk. Beat until combined and then add remaining icing sugar and milk. If you feel the mixture is too dry, add another tablespoon of milk. Just be careful because you want the icing to be thick enough to hold its shape when piped. Add a few drops of cotton candy flavouring – to taste. Dish out the frosting into three separate bowls. Add a few drops of food colouring to each bowl and stir with a spoon until you achieve your desired colours. Grab your piping bag and insert a large star tip into the end. Very gently add spoonfuls of one icing and try keep it to one side of the piping bag. Repeat with remaining colours. Essentially you’re trying to make the colours sit vertically in the piping bag. You don’t have to be exact, just do the best you can. Gently press down to remove any air bubbles and force the icing down to the tip. Twist the top of the bag and pipe icing onto the cupcakes. The first one probably won’t have all three colours so use that one as a test run. 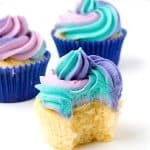 If you are visual person, check out this video by Cupcake Jemma which shows how to pipe Rainbow Buttercream. For tips on piping check out my cupcake frosting post here. I purchased the cotton candy flavouring from a speciality cake store. These are so Instagrammable and adorable! 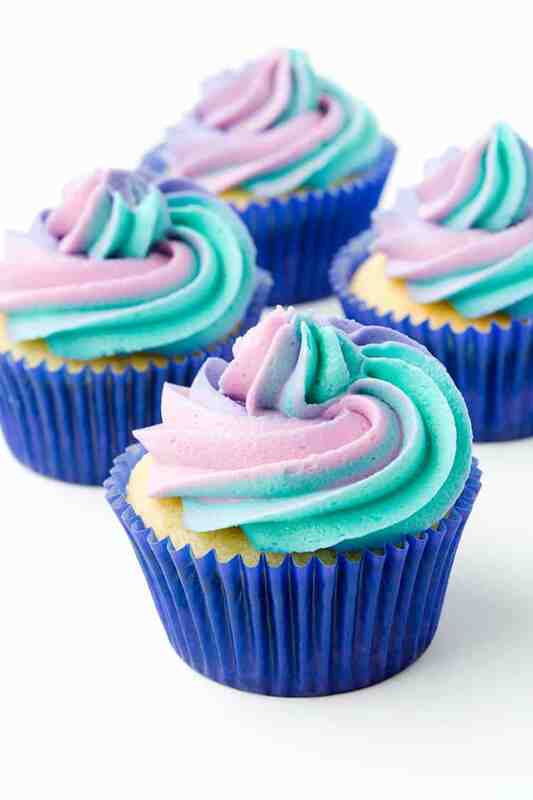 These cotton candy cupcakes look yummi! Can i post it on my blog? Hi Bella, thank you so much! You can blog about this recipe if you link back to the full recipe on my website. Thanks! Gorgeous pictures. I made these cotton candy cupcakes for the super bowl party and it was a crowd favorite. I’m also gonna pin this post on my Pinterest board my followers will love it. Thanks for sharing, Jess! These are just the prettiest cupcakes!! I can’t get over that frosting! Can Cake flour be used instead of all purpose? Hi Chelle, I haven’t tried this myself but I think it would be ok. Let me know how you go! I love your tips for better cupcakes! Thanks! I made these cupcakes for a picnic and they came out delicious! 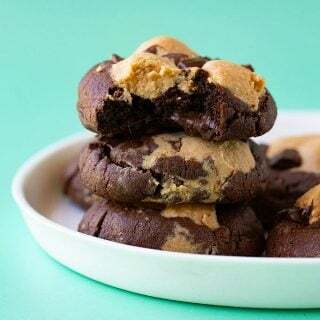 They were so light, fluffy and easy to make. I decorated them with edible butterflies to go with the whole Spring theme. I will definitely be making these again as well as experimenting with different flavoured frosting! When I want swirl frosting, I put the frosting on plastic wrap, wrap it up, twist the ends , then place in the piping bag. Actually, I do this with all frosting… It makes for an easier clean up. Hi Pierre, thank you so much for leaving such a lovely comment. I hope you get a chance to make these cupcakes – please let me know how you go if you do. Have a great weekend! That frosting is amazing! I didn’t even know they made cotton candy flavoring! Great cake tips, Jess! The one about actually creaming is so true. I’ll add on to your third one to say that if you do alternate, do it quickly and always add the next addition when the batter is still very streaky to prevent over mixing. If you over mix you will end up with tough, not tender, cake; tunneling; and a dome in the center. Pinned! Thanks so much Lindsey the cake master! That’s a great tip, I didn’t even think of that. Love it!! These look so cute! I love the pastel coloured frosting. I didn’t know you could get cotton candy flavouring either. What fun cupcakes! 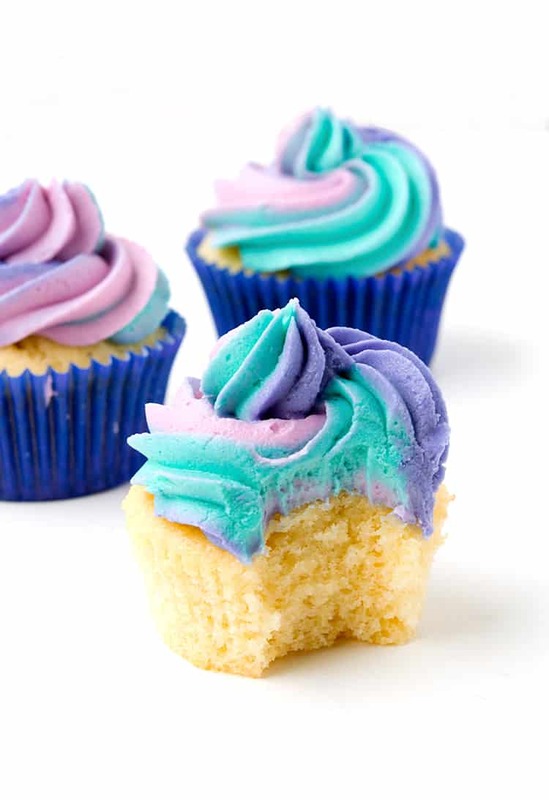 I love the cotton candy frosting and your cupcake making tips are so helpful! I’ve never heard of cotton candy flavouring before… I need some!! How cool!! Gosh your frosting is just beautiful! Thanks so much Lucy! Neither had I until I spied it in the cake store, I had to have it! I don’t really have any cake tips, I’m no baking expert! …but it looks like you are!! Oh my gosh! All of your recipes look out-of-this-world delicious!! Beautiful blog my friend!! Thanks so much Cailee, that is so sweet! 🙂 Appreciate you stopping by and leaving such a lovely comment. Beautiful colors. My eyes have just been fed for the day, thank you! I LOVE THESE CUPCAKES! Sorry to shout, but these cupcakes just make me feel like singing and dancing and riding on a unicorn through cotton candy clouds! That frosting is just picture perfect – you are a talented lady! I cannot wait to make these for my family very soon! You are too kind Amy! I love your beautiful comments – thank you for always making my day!